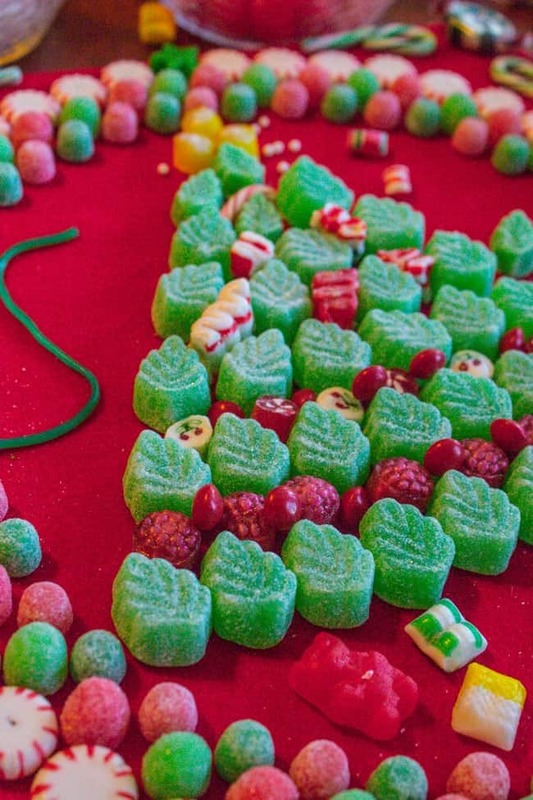 Learn how to make your own Candy Christmas Tree craft to deck the halls this year! 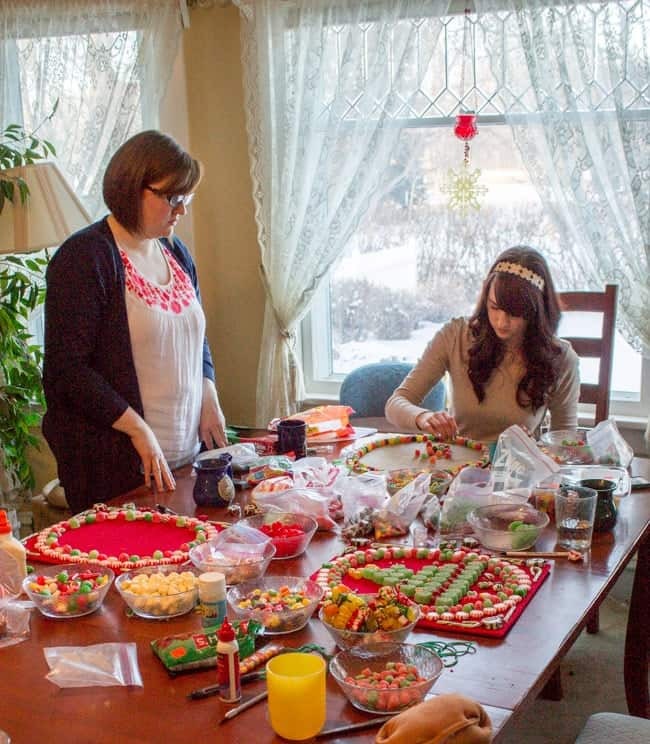 Get some felt and burlap and a TON of old fashioned candy and start glueing away. My mother-in-law still has the one she made 30 years ago! Guys, I made a craft! This is kind of momentous. I’m the one who can barely put together an outfit on my own, remember? I don’t do cutesy stuff. I can’t even claim this Candy Christmas Tree, really, because I had Eric’s mom and sisters to help me out. They are the classy type. They throw around terms like “chartreuse” and “charger plates” and “damask” on a regular basis and I’m like, what are you even talking about? I come from a paper plate kind of family. We made these last year, and I’m sitting here trying to remember all the details so that I can tell you about it. I text my mother-in-law Kris to see if we used a stapler or a staple gun to secure the burlap to the wood. She texted back that we used a “heavy dory stapler,” and I googled what that was immediately, because Kris knows stuff about crafts and I don’t. I’d never heard of a heavy dory stapler but it must be a thing. Probably you can buy them at Hobby Lobby. Nope. Heavy duty stapler. It was a typo. These two are the ones my sisters-in-law made. Jessie’s is on the left and Britta’s is on the right. We hadn’t mounted them on the second board yet. I’m going to walk you through the tutorial, but there is a printable “recipe” below. Here we go! 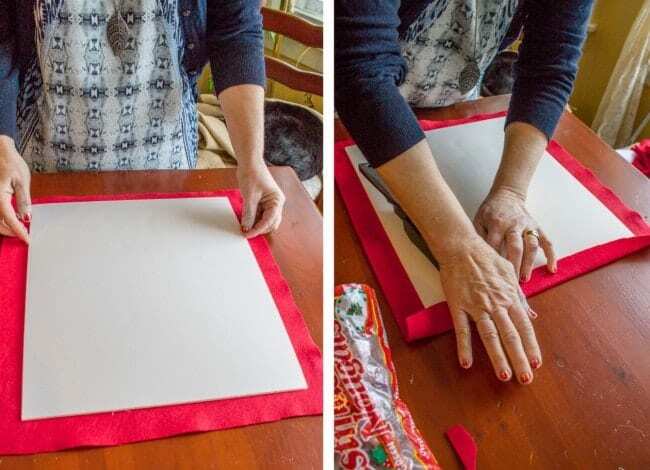 Use a heavy duty (or “dory”) stapler to wrap the edges of the fabric around the back of the board. 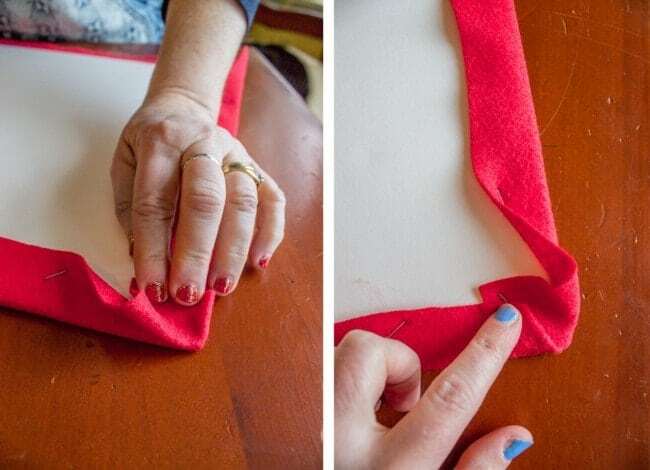 You can trim the excess fabric if there is too much to staple easily. Sadly I don’t have any pictures of the next step. 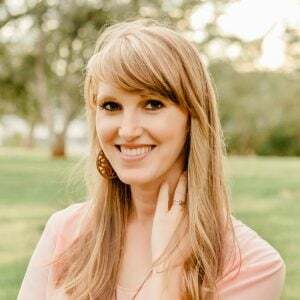 Use the same method described above to staple the 20×22 inch piece of burlap (or felt; whatever is opposite of what you just did) to the plywood. Use the stapler to secure the smaller rectangle (foam core) onto the covered plywood. 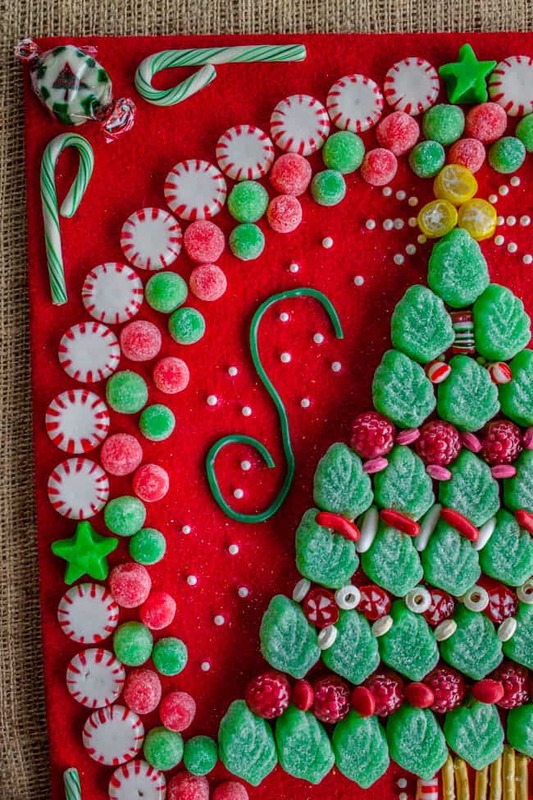 Think this through before you staple; you should only staple on spots where you KNOW you want to glue candy on top, so that the staples aren’t visible. I think we made 4 staples on mine, in the 4 corners underneath the Christmas Tree Nougats (the only candy that I left in the wrapper, for reference). Now it’s time to bust out the candy. I didn’t provide amounts for the candy, because it totally depends on what you want your tree to look like. 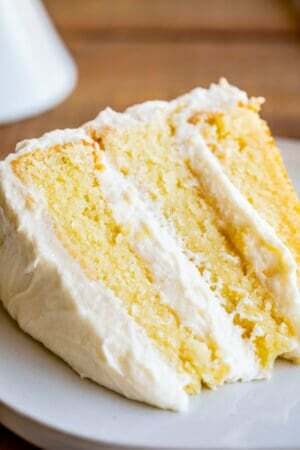 But the good news is that you can eat any that’s left over! It’s kind of like how “making gingerbread houses” is really code for “let’s eat tons of candy.” Don’t forget to buy pretzel sticks if you want to use that for your tree trunk. Don’t forget to embellish the corners somehow. Once the oval is done, get to work on the tree! 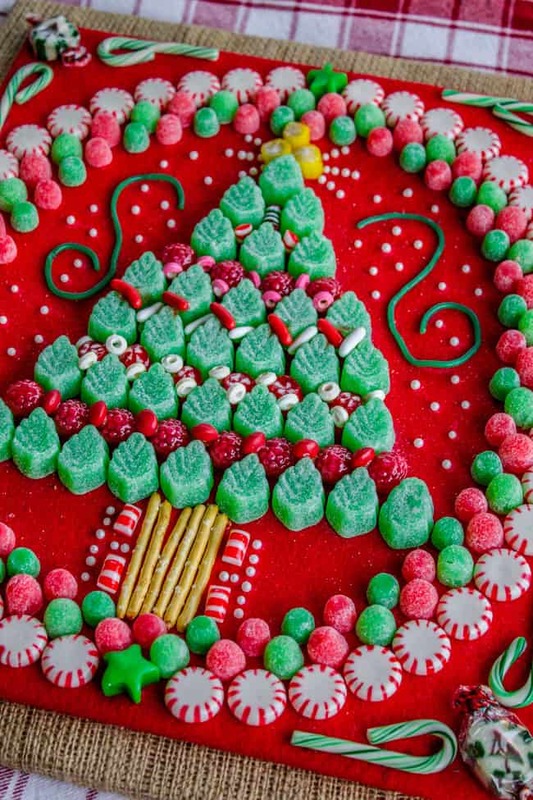 I almost used the bear and the green and yellow candies at the bottom as “presents” under the tree, like Britta and Kris’s up there, but in the end decided to do more pearl sugar and some red candy. 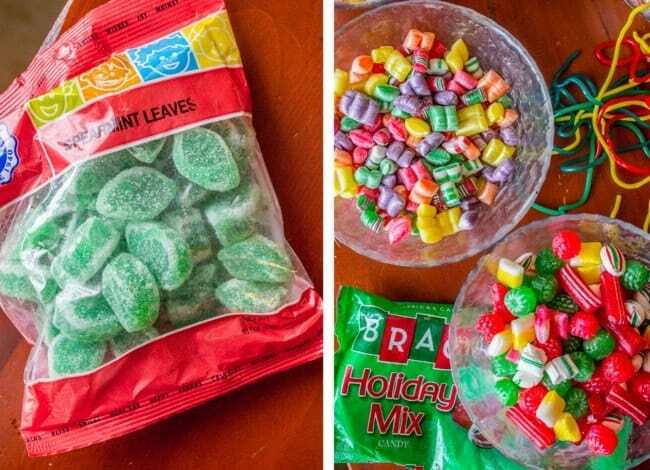 Once your candy is all glued on, let it dry at least overnight. Nail or screw in a picture hanger on the back. If you have a specific spot on the wall where you’ll be hanging your Christmas tree craft don’t forget to measure. 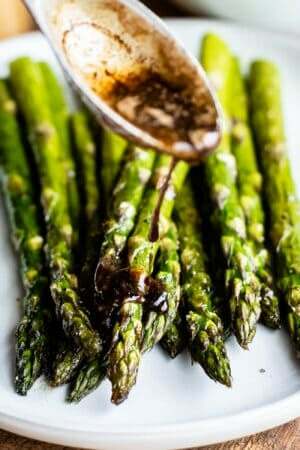 Use a measuring tape to center the hanger left-to-right. 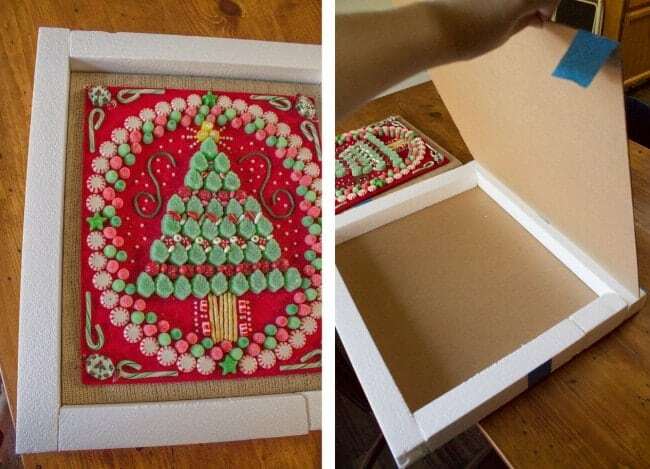 How to store your Christmas Tree craft. Two large pieces of cardboard that were the same size (bigger than the plywood). Pieces of styrofoam that he glued around the edge of one. (Styrofoam that is taller than the candy sticks up.) 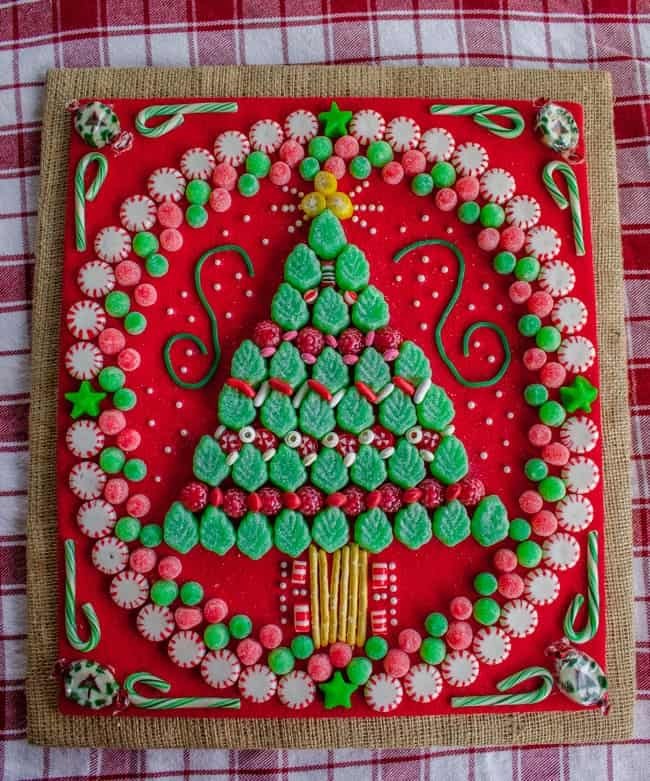 The candy tree goes in the middle, then the other piece of cardboard is taped on top. This year when I opened it, I slit the tape on 3 sides so that it opened up like a book. You will want to store this in your house, not in the garage or attic. The candy needs to be stored somewhere where there is climate control; if it gets too hot it might melt. This year I think I will take an extra step and wrap the cardboard in plastic (we have the kind of plastic that movers use to protect furniture, but saran wrap would probably work the same, you would just need a lot.) If you have a sealed plastic bin that it can fit in, even better. Whew! 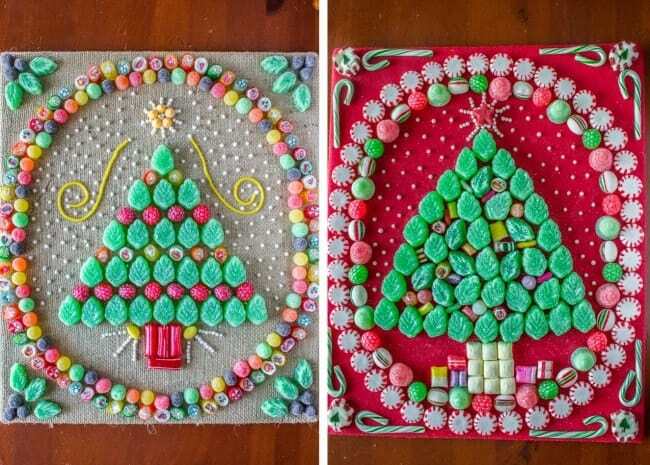 I hope you enjoy looking at your candy tree every Christmas! I’ve been dying to hang mine up all year and love the way that it looks now that it’s on the wall. You have to promise to show me your tree if you do this project! 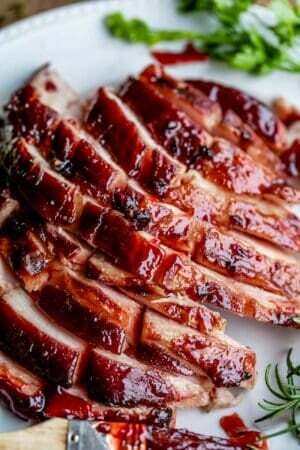 Snap a photo and share it on Instagram using the hashtag #thefoodcharlatan. I would love to see what your tree looks like! 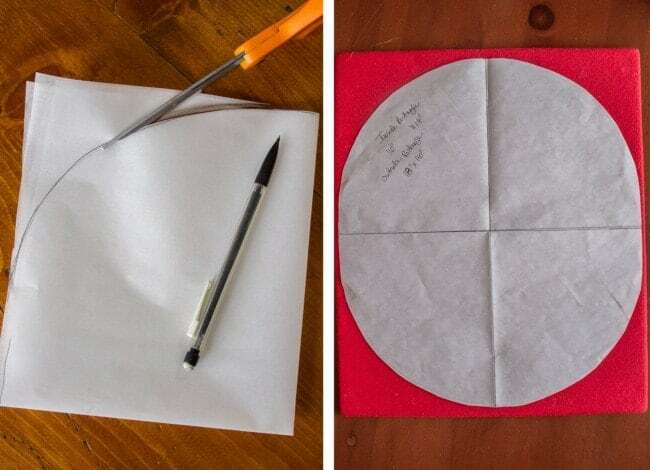 Use a stapler to wrap the edges of the fabric around the back of the board. 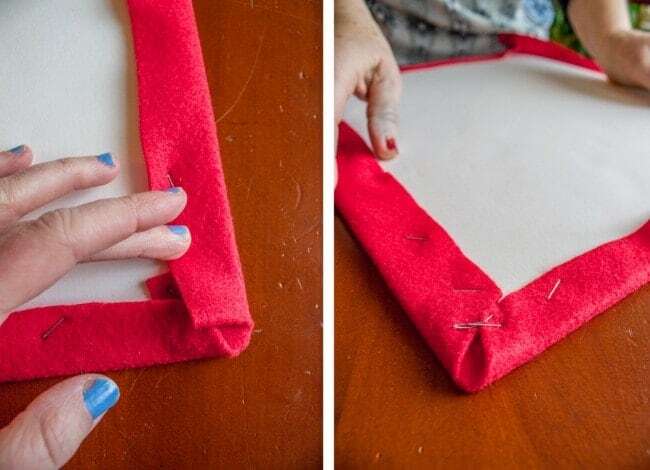 You can trim the excess fabric if there is too much to staple easily. Use the same method described above to staple the 20x22 inch piece of burlap (or felt; whatever is opposite of what you just did) to the plywood. Use the stapler to secure the smaller rectangle (foam core board) onto the covered plywood. Think this through before you staple; you should only staple on spots where you KNOW you want to glue candy so that the staples aren't visible. 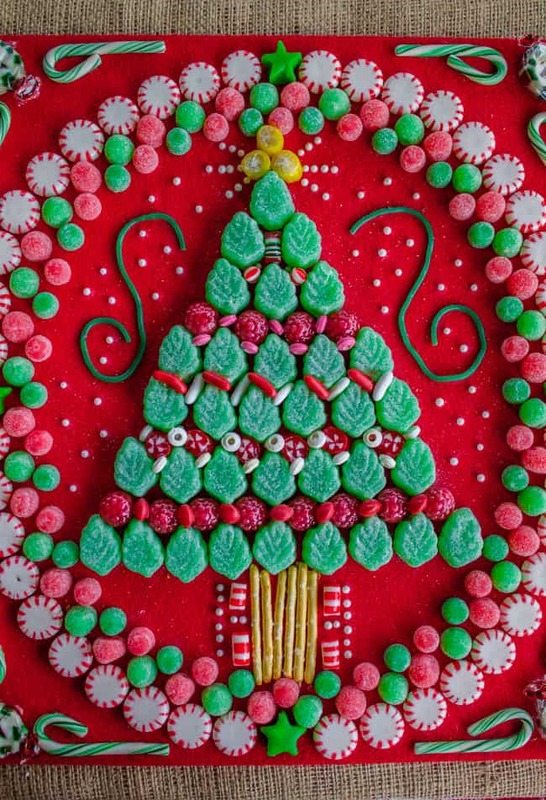 Start by glueing candy on the oval before you start on the tree, to make sure you have room for it. 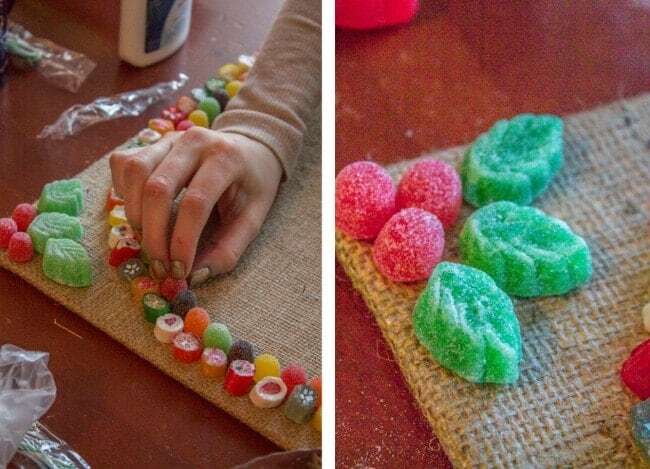 Use lots of glue and candy to make your tree. Don't forget to embellish the corners. Nail or screw in a picture hanger on the back. To store: Use two large pieces of cardboard that are the same size (larger than the wood). 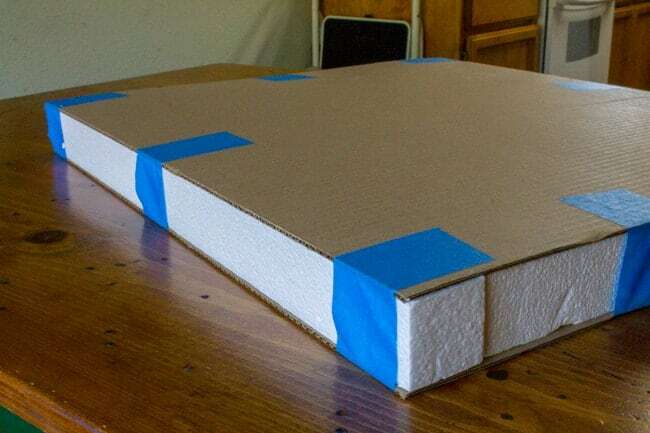 Use pieces of styrofoam and glue them around the edge of one piece of cardboard. 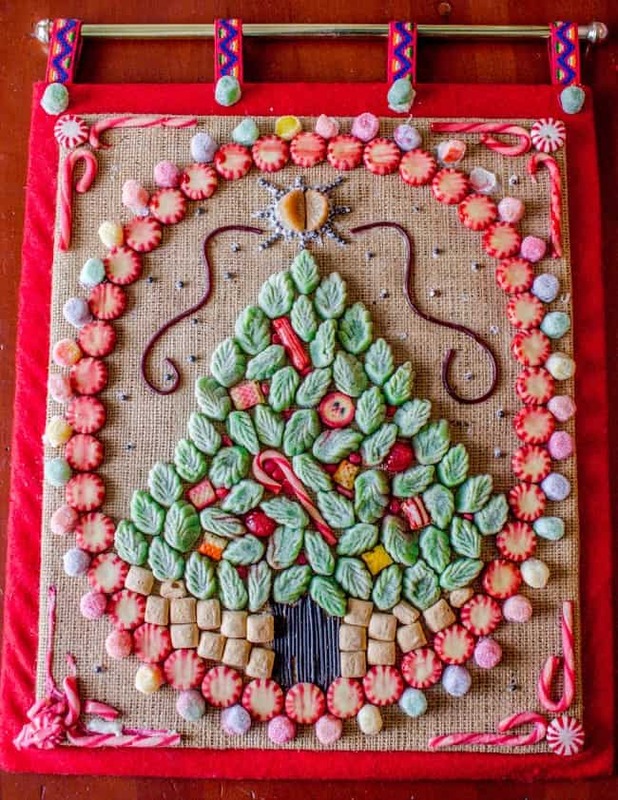 (Styrofoam must be taller than how far the candy sticks up from the felt) The candy tree goes in the middle, then the other piece of cardboard is taped on top. When you open it the next year, slit the tape on 3 sides so that it opens up like a book. You will want to store this in your house, not in the garage or attic. 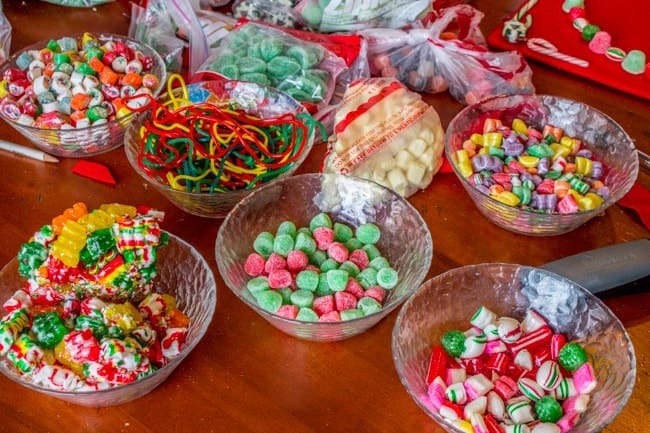 The candy needs to be stored somewhere where there is climate control; if it gets too hot the candy may melt. This year I think I will take an extra step and wrap the cardboard in plastic (we have the kind of plastic that movers use to protect furniture, but saran wrap would probably work the same, you would just need a lot. If you have a sealed plastic bin that it can fit in, even better. 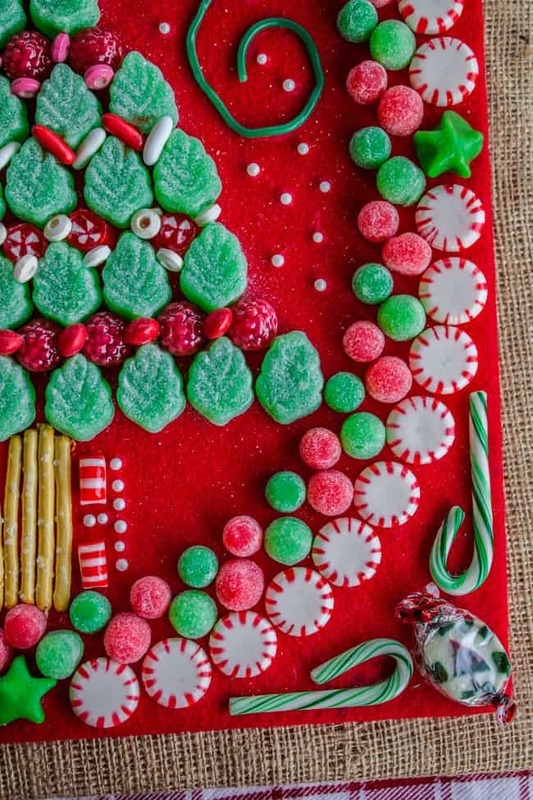 Here are some Christmas recipes to check out if you are not into crafts! 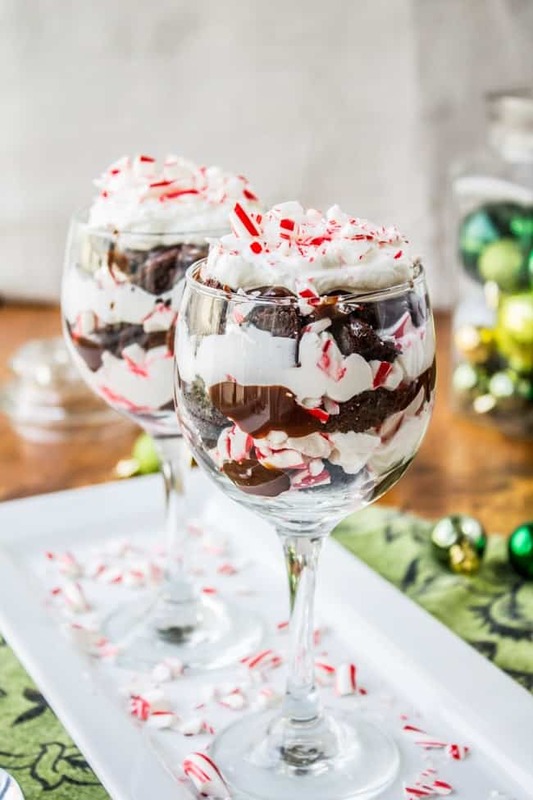 Candy Cane Brownie Trifle << hugely popular and one of my favorite Christmas desserts! So rich. 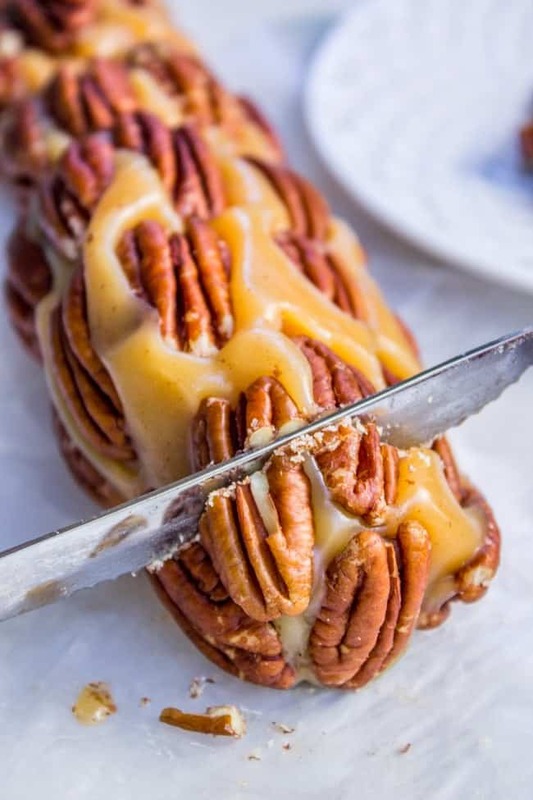 Caramel Nougat Pecan Roll << this one takes some doing, but it’s SO worth it! 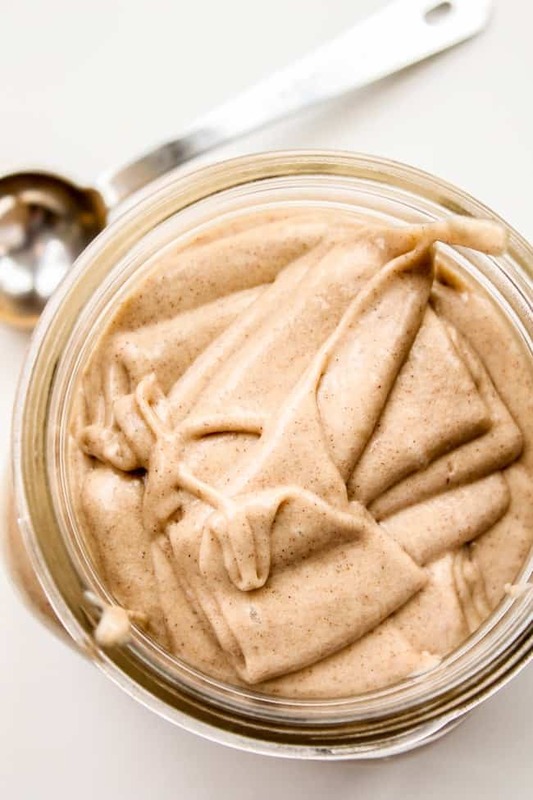 Cinnamon Honey Butter << this makes a great spread for rolls or even a neighbor/host gift! This is such a CUTE idea!! LOVE LOVE it!! Thanks for sharing this Karen! I hope lots of families enjoy making this together. I have so many fond memories of my mother and I making this and other Christmas projects together. It’s what makes Christmas feel like Christmas! Just add some hot chocolate and Christmas music and you are ready for the season! DUDE. This is amaaaaazing! Martha Stewart ain’t got nothin’ on you! I love this idea! 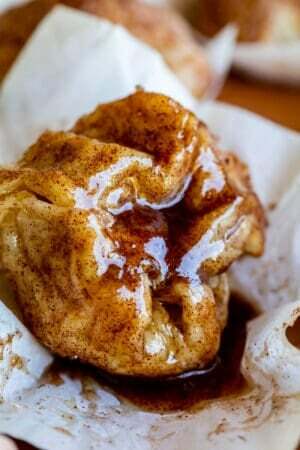 Cute, SWEET, and something fun kiddos can help with! Impressive! 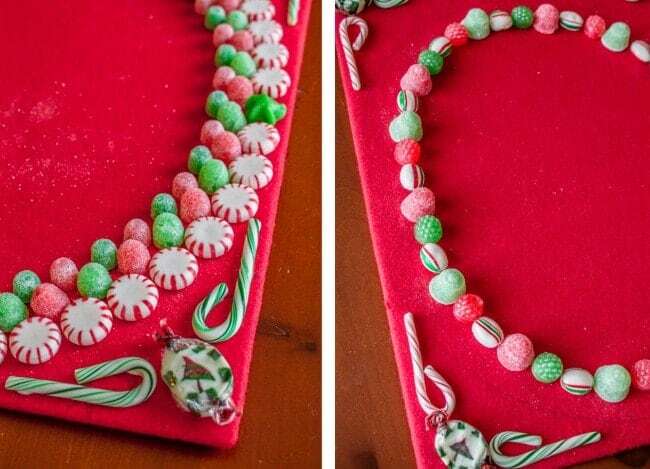 Reminds me of the candy wreath that my great grandmother made and shared with us when we visited one Christmas. But we ate the candy after cutting it off the wire! So it was not an enduring craft like this one. What! Edible Candy Wreath!! That sounds so fun! Did she just use lifesavers or what? I think I need to adopt this tradition !